A new approach to learning anatomy: Use your favorite ebook device and learn the most relevant anatomical structures of the Knee – Axial MRI on the go. Look at an illustration of a structure and flip the page to see the answer in both english and latin terminology. Additional information (when available) about origins, insertions, innervation and functions of the structure teach you all the details. Make the most of the clearest, most accurate illustrations today. Trusted by hundreds of thousands of students around the world who have used kenhub.com to learn anatomy. 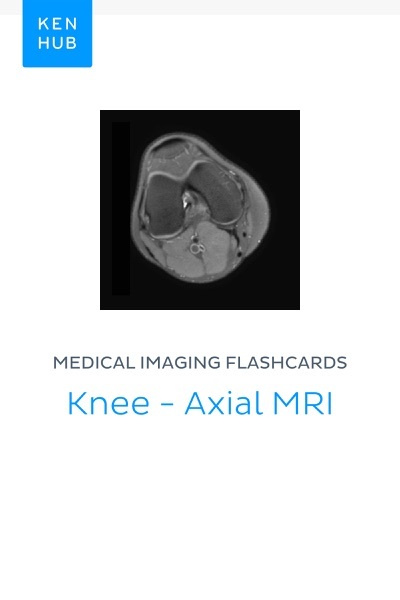 Axial, Flashcards, Imaging, Knee, Medical, MRI permalink.